This project template is available for SIM SDK Edition only. The Image Generator (IG) renders scenes of the virtual world, providing an immersive view of the simulation, it can be thought of as a viewport into the virtual world of simulation. A simulator may have one or more IG channels rendering an "out-the-window" view and might have several additional views representing various sensors: electro-optical (EO), infrared (IR), and night vision (NV); and sometimes radar. The way these views are displayed may vary from a simple desktop monitor to a multiple projector dome display. The IG uses the terrain database and a set of entities (aircrafts, vehicles, etc.) 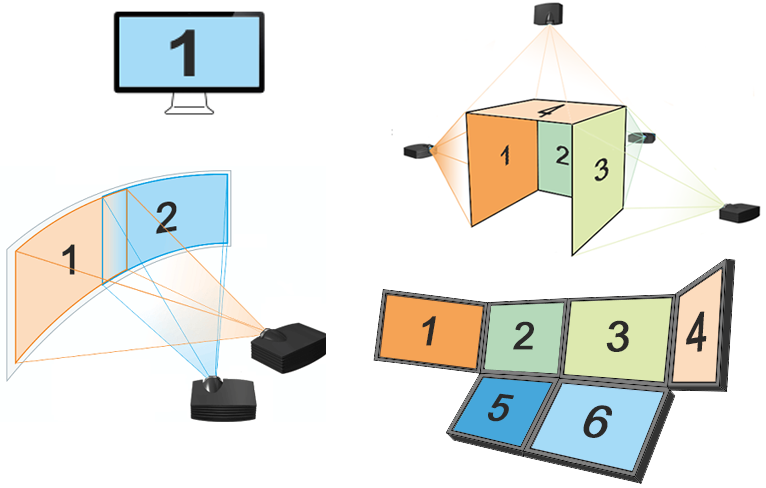 to render a scene, along with sky, weather and visual effects, from the specified perspective, and sends a video signal to the appropriate display within the user interface. The IG receives updates and events from all the other hosts from the network, be it a vehicle/aircraft simulation host, instructor operator station (IOS), physical simulation host, etc. The IG also responds to requests from other hosts to check for intersections with the terrain to determine if the vehicle/aircraft bumps into anything or has a line-of-sight to another entity(ies). 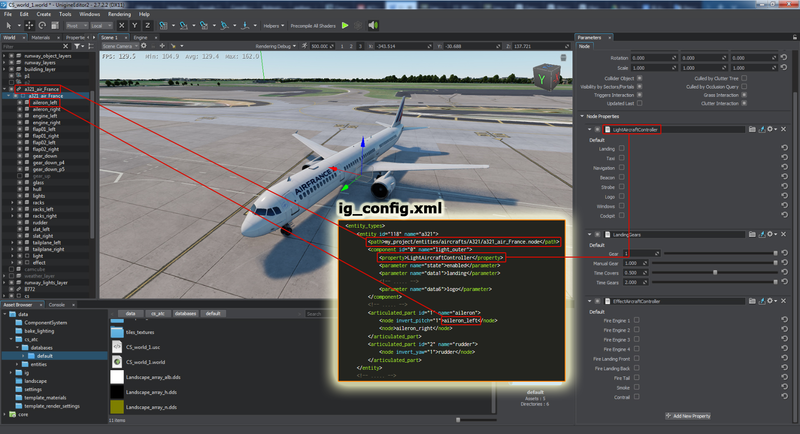 The simulator and the IG can be integrated into a single application, where the simulator uses API calls to control the IG. 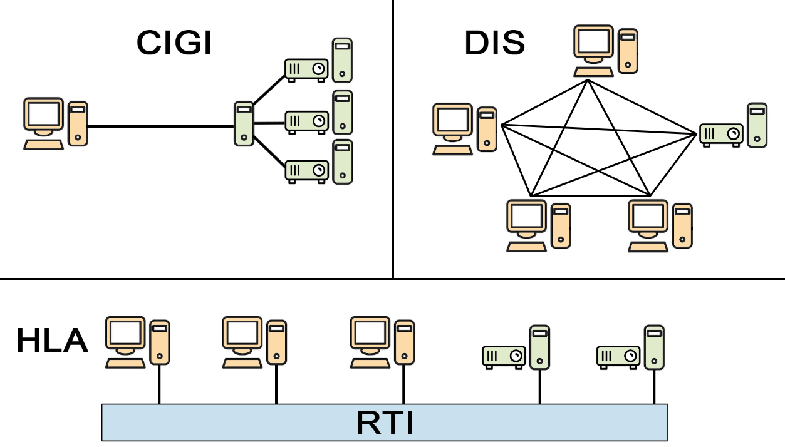 Or, the simulator can be connected to the IG via a network connection and communicate by sending/receiving messages specified by an interface control document such as CIGI (Common Image Generator Interface). Or, they can be connected using the distributed simulation network and pass messages using communication protocols such as DIS or HLA. HLA is a standard for interoperability among simulations. Rather than a networking protocol (wire standard) like DIS, HLA defines an architecture with a set of Application Programmer’s Interface (API) Standards. Simulation applications (known as federates) communicate by making calls to the HLA APIs. A piece of software known as the Runtime Infrastructure (RTI) implements the HLA API, and is responsible for transporting data from one federate to another. A Terrain Database (or simply Database) is a virtual model of the landscape where the simulation takes place. Its character, quality, and content defines what can be done in the simulation environment. 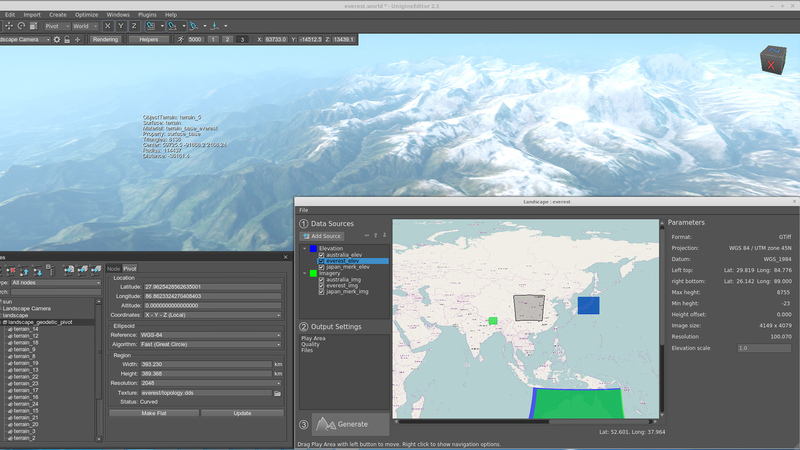 The resolution and level of detail of the terrain database content define the fidelity of interactions possible within the environment. UNIGINE supports double-precision coordinates enabling you to extend geographic coverage of the terrain, that defines the size of the area where the simulation can take place, up to the whole Earth's surface. Within the IG, all entities, lights, databases, etc. are referred to via IDs. Simple articulation of entities' parts is performed based on XML definition and does not require a modeler to prepare any animations. UNIGINE IG is currently implemented as IG Template. Hat-hot requires ObjectTerrainGlobal in the scene. Otherwise, it returns 0. The Setting Up Properties article for more details on adjusting properties for new entities. The IG Configuration article for more details on setting up your IG. 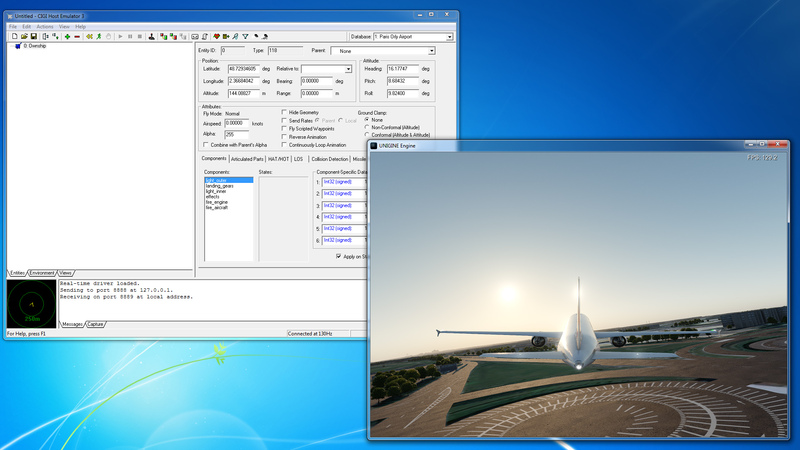 The Environment Settings article for more details on configuring sky and weather parameters. Open the SDK Browser, go the the Projects tab, and create a new project using the IG Template. 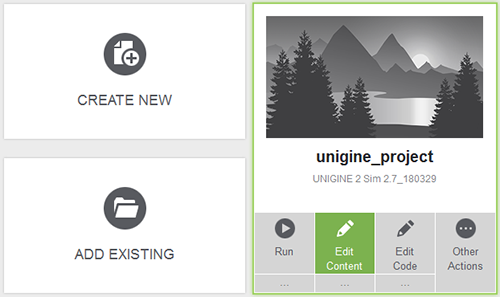 Open the world in UnigineEditor by clicking Edit Content. Use the Landscape Tool to generate a terrain. The process of terrain generation is shown in the Georeferenced Terrain Generation video tutorial. 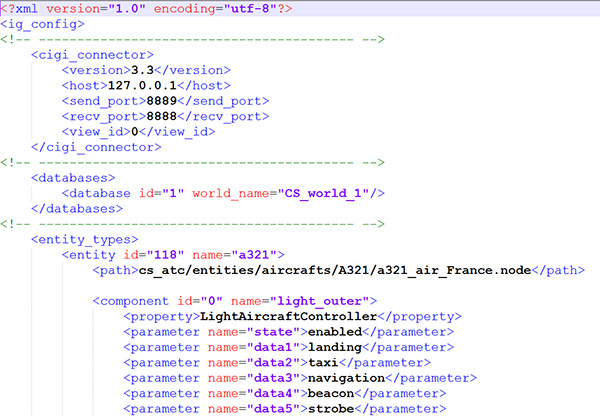 Add models (as node references) to represent entities used in your simulation (aircrafts, vehicles, etc.). Assign properties (lights, landing gears, wheels, controllers, effects, etc.) to the corresponding nodes and adjust their parameters as required. 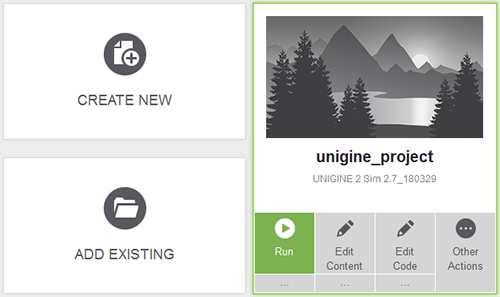 Save your world and close Unigine Editor. Launch your IG application by clicking Run. By default your application will launch with IG, CIGIConnector plugins. 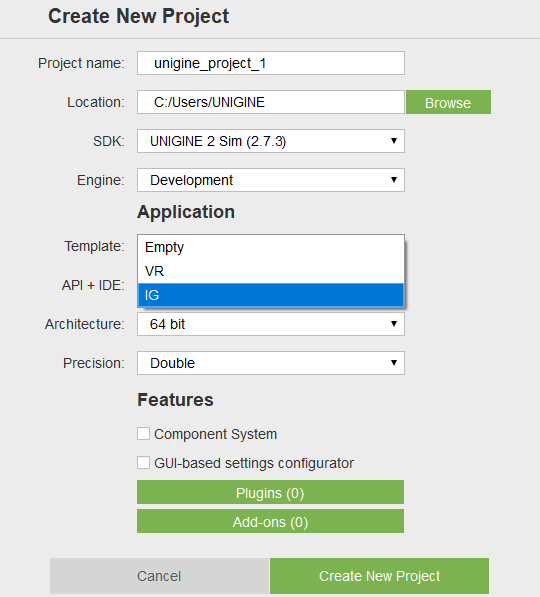 If you want to change this, please modify the startup options after clicking an ellipsis under the Run button for your project on the Projects tab of the SDK Browser. If you want to use a Multi-IG configuration, you should add the Syncker plugin to the startup options: -extern_plugin "Syncker" and perform steps 2 - 5 described here. IMPORTANT: do not add the IG Plugin on slaves, as it may result in incorrect behavior of components. Launch your host application or a CIGI Host Emulator to communicate with your IG. IG can be built into a Qt/WinForm/WPF application and have a custom interface (e.g., switching between cameras in the simplest case). A host can have several IGs connected, and each running IG can be programmed to have its own logic, if necessary. Secondary static objects (such as a billboard on a building or a ship following a certain route) can be animated, and their position, rotation, or other specific parameters can be requested via CIGI/HLA. New visual effects can be created to create a more realistic picture. Users can add their own components and process them by modifying the ig_config.xml file. You can extend IG functionality to support other protocols (e.g. ALSP, TENA, CTIA, etc. ), for this purpose you'll have to write your own connectors. A connector is actually a custom C++ Plugin used to communicate messages between the host and the IG. This plugin reads packages and calls the corresponding methods of the IG Plugin (listed in include/plugins/IGInterface.h).